Telangana State Board of Intermediate Education, TSBIE released the TS Inter Supplementary Examination scheduled for 2019. As per the information shared by the board, TS supplementary exam dates 2019 will starts from 16th May2019. The board had released the TS Inter Results 2019 yesterday. As many as 8.70 lakh students had appeared for the TS Intermediate examinations â€“ IPE May 2019. The pass percentage for both TS Intermediate 1st and 2nd year dropped in 2019. Pass percentage for TS Inter First year was recorded at 59.8 percent and that for 2n year it was recorded at 65 per cent. For the students who have not qualified or who wish to improve the TS Intermediate result can appear for the Advanced Supplementary Examination or IPASE. TS IPASE examination are conducted in May and the board would release separate hall tickets for the same. Candidates interested in appearing for the TS Supplementary examination may check the schedule on the official website once released. The supply time table and dates would also be published on this page once released. The Intermediate Pubic Examination (IPE) is conducted by the board of Intermediate education, Telangana. This board was established by undivided Andhra Pradesh in the year of 1971 to regulate the system of Intermediate education in the state. Undivided Andhra Pradesh is the 1st state in the country to adopt 10+2+3 pattern of education. After the formation of Telangana state Board of Intermediate Education, Telangana was formed in 2014. Honorable Minister of the State for Secondary Education acts as chairman and secretary to Government, Secondary Education as vice-chairman of the board. The secretary of I.A.S. Rank acts as the chief executive of the board. Intermediate is a Two-Year course appeared by all the candidates who have successfully completed their schooling, i.e., have got their Class 10 certificate either through SSC or CBSE or ICSE Boards. This is said to be the most important phase in any students life which will decide their future. Intermediate is mandatory for all the candidates who need entrance into Degree or Graduation level education. There are different courses in Intermediate for the candidates to choose according to their Interest. Approximately there are around 85 different courses. Popular Intermediate courses among the students are MPC(Mathematics, Physics, Chemistry), BiPC(Biology, Physics, Chemistry), MEC(Mathematics, Economics, Commerce), CEC(Civics, Economics, Commerce). The examination for Intermediate students is conducted every year in the month of March. Every candidate must appear for the Intermediate Examination 2 times i.e., in the 1st year of Intermediate Education which is also called Junior Inter and again after the 2nd Year of Intermediate which is also called Senior Inter. It is mandatory for all the candidates to get through both the years of Intermediate Examinations to get the certificate from the State Board of Intermediate Education, Telangana. The course starts in the month of June every year. Year End exams for 1st year students or Junior Inter students will be held in the month of March. For the academic Year 2017-2019 the 1st year Final Exams for Junior Inter students will commence from 27.02.2019. However according to the official Press release these are only tentative dates for the TS Intermediate Examination 2019. Ethics & Human Values Examination is proposed to be conducted on 28-01-2019(Monday) from 10:00 A.M to 01:00 P.M.
Environmental Education Examination is proposed to be conducted on 30-01-2017(Wednesday) from 10:00 A.M. to 01:00 P.M. The Intermediate Practical Examinations are proposed from 01-02-2019 (Friday) to 20-02-2019 (wednesday) including sundays for both General and Vocational Courses. The course starts in the month of June every year. Year End exams for 2nd year students or Senior Inter students will be held in the month of March. For Senior Intermediate Students or 2nd Year Inter students there will be Practical Exams for those who opted for Biology, Chemistry & Physics as their Main subject of study before the Public examinations. 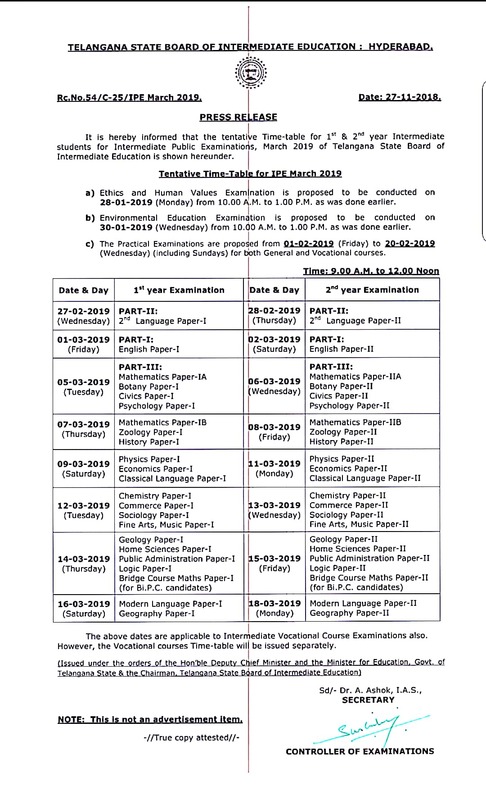 The tentative date for commencement of Practical examinations is 02-02-2019 to 22-02-2019 for both General & Vocation 2nd Year Intermediate students. For the academic Year 2017-2019 the 2nd year Final Exams for Senior Inter students will commence from 28.02.2019. 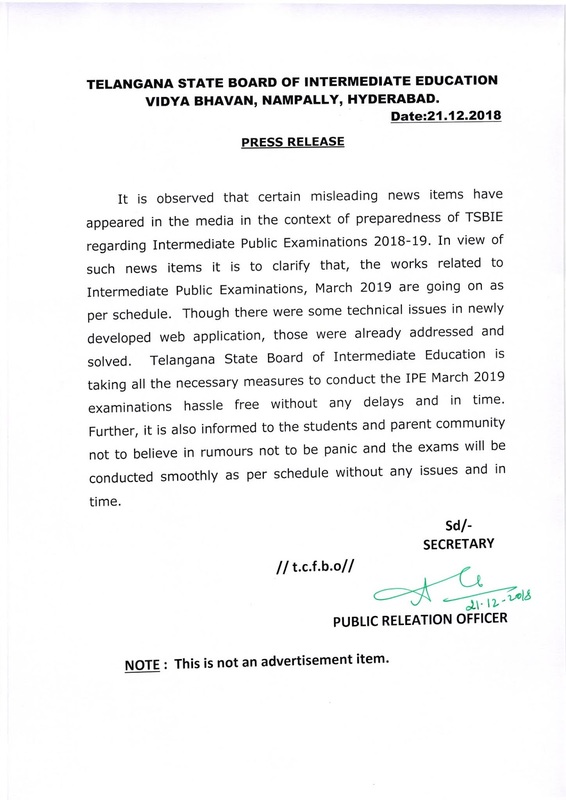 However according to the official Press release these are only tentative dates for the TS Intermediate Examination 2019. Click on Telangana Intermediate Examination 1st & 2nd Year Exam Time Table March 2019 link. You will be redirected Telangana Intermediate Examination 1st & 2nd Year Exam Time Table Page. You will find both 1st Year & 2nd Year Exam time table in the same PDF File.